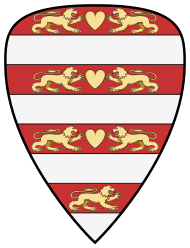 Andrew II (Hungarian: II. 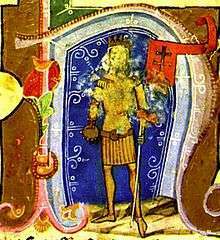 András, Croatian: Andrija II., Slovak: Ondrej II., Ukrainian: Андрій II; c. 1177 – 21 September 1235), also known as Andrew of Jerusalem, was King of Hungary and Croatia between 1205 and 1235. He ruled the Principality of Halych from 1188 until 1189/1190, and again between 1208/1209 and 1210. He was the younger son of Béla III of Hungary, who entrusted him with the administration of the newly conquered Principality of Halych in 1188. Andrew's rule was unpopular, and the boyars expelled him. Béla III willed property and money to Andrew, obliging him to lead a crusade to the Holy Land. Instead, Andrew forced his elder brother, King Emeric of Hungary, to cede Croatia and Dalmatia as an appanage to him in 1197. The following year, Andrew occupied Hum. Despite the fact that Andrew did not stop conspiring against Emeric, the dying king made Andrew guardian of his son, Ladislaus III, in 1204. After the premature death of Ladislaus, Andrew ascended the throne in 1205. 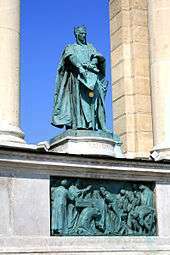 According to historian László Kontler, "[i]t was amindst the socio-political turmoil during [Andrew's] reign that the relations, arrangements, institutional framework and social categories that arose under Stephen I, started to disintegrate in the higher echelons of society" in Hungary. Andrew introduced a new grants policy, the so-called "new institutions", giving away money and royal estates to his partisans despite the loss of royal revenues. He was the first Hungarian monarch to adopt the title of "King of Halych and Lodomeria". He waged at least a dozen wars to seize the two Rus' principalities, but the local boyars and neighboring princes prevented him from conquering the principalities. He participated in the Fifth Crusade to the Holy Land in 1217–1218, but the crusade was a failure. 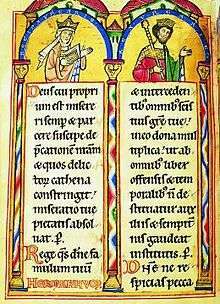 The leaders of the crusade included John of Brienne, King of Jerusalem, Leopold of Austria, the Grand Masters of the Hospitallers, the Templars and the Teutonic Knights. They held a war council in Acre, with Andrew leading the meeting. In early November, the crusaders launched a campaign for the Jordan River, forcing Al-Adil II, Sultan of Egypt, to withdraw without fighting; the crusaders then pillaged Beisan. 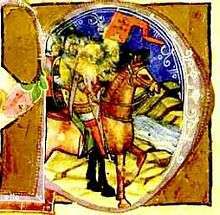 After the crusaders returned to Acre, Andrew did not participate in any other military actions. Instead, he was collecting relics, including a water jug allegedly used at the marriage at Cana, the heads of Saint Stephen and Margaret the Virgin, the right hands of the Apostles Thomas and Bartholomew and a part of Aaron's rod. If Thomas the Archdeacon's report of certain "evil and audacious men" in Acre who "treacherously passed him a poisoned drink" is reliable, Andrew's inactivity was because of illness. 1 2 Kontler 1999, p. 75. 1 2 Kristó & Makk 1996, p. 229, Appendix 4. ↑ Kristó 1994, p. 43. 1 2 3 4 5 6 Almási 2012, p. 86. 1 2 Kristó & Makk 1996, p. 229. ↑ Dimnik 2003, p. 191. 1 2 3 Kristó & Makk 1996, p. 224. ↑ Dimnik 2003, pp. 191, 193. 1 2 3 4 5 Dimnik 2003, p. 193. 1 2 3 4 5 6 7 Érszegi & Solymosi 1981, p. 127. 1 2 3 Engel 2001, p. 54. 1 2 Dimnik 2003, pp. 193–194. ↑ Érszegi & Solymosi 1981, p. 122. ↑ Berend, Urbańczyk & Wiszewski 2013, p. 249. ↑ Berend, Urbańczyk & Wiszewski 2013, p. 234. 1 2 Bartl et al. 2002, p. 30. 1 2 3 Érszegi & Solymosi 1981, p. 124. 1 2 3 4 Curta 2006, p. 347. ↑ Fine 1994, p. 22. ↑ Curta 2006, p. 370. ↑ Fine 1994, p. 52. ↑ Bárány 2012, p. 132. ↑ Érszegi & Solymosi 1981, pp. 124–125. 1 2 3 4 5 Érszegi & Solymosi 1981, p. 125. 1 2 3 Kristó & Makk 1996, p. 230. 1 2 3 Érszegi & Solymosi 1981, p. 126. ↑ Archdeacon Thomas of Split: History of the Bishops of Salona and Split (ch. 23. ), pp. 141–143. 1 2 3 4 5 Engel 2001, p. 89. ↑ Archdeacon Thomas of Split: History of the Bishops of Salona and Split (ch. 23. ), p. 143. 1 2 Kristó & Makk 1996, pp. 227, 231. ↑ Kristó & Makk 1996, pp. 227–228. ↑ Bartl et al. 2002, p. 31. 1 2 3 4 Engel 2001, p. 91. 1 2 3 Berend, Urbańczyk & Wiszewski 2013, p. 427. ↑ Engel 2001, pp. 91–92. ↑ Engel 2001, p. 93. ↑ Dimnik 2003, pp. 251–253. ↑ Dimnik 2003, pp. 253–254. 1 2 Berend, Urbańczyk & Wiszewski 2013, p. 441. ↑ Dimnik 2003, pp. 254–255, 258. 1 2 3 4 Dimnik 2003, p. 263. 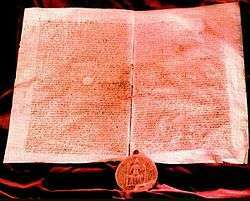 ↑ The Hypatian Codex II: The Galician-Volynian Chronicle (year 1207), p. 19. ↑ Bárány 2012, p. 136. 1 2 3 4 5 Érszegi & Solymosi 1981, p. 128. ↑ Dimnik 2003, pp. 263–264. ↑ Dimnik 2003, p. 264. ↑ The Hypatian Codex II: The Galician-Volynian Chronicle (year 1210), p. 20. 1 2 Kristó & Makk 1996, p. 233. ↑ Engel 2001, pp. 90–91. ↑ Kristó & Makk 1996, pp. 232–233. 1 2 3 Berend, Urbańczyk & Wiszewski 2013, p. 428. ↑ Almási 2012, p. 88. ↑ Kristó & Makk 1996, pp. 232–234. ↑ Anonymus, Notary of King Béla: The Deeds of the Hungarians (ch. 9), p. 27. ↑ Kristó & Makk 1996, p. 234. 1 2 Magaš 2007, p. 58. ↑ Fine 1994, p. 149. 1 2 3 Érszegi & Solymosi 1981, p. 129. 1 2 3 4 Dimnik 2003, p. 266. ↑ The Hypatian Codex II: The Galician-Volynian Chronicle (year 1211), p. 20. 1 2 Kristó & Makk 1996, p. 236. ↑ Spinei 2009, p. 145. ↑ Fine 1994, p. 102. 1 2 3 4 5 6 7 Érszegi & Solymosi 1981, p. 131. ↑ Spinei 2009, pp. 145–146. ↑ Engel 2001, p. 90. ↑ Curta 2006, p. 404. 1 2 3 4 5 6 7 8 Érszegi & Solymosi 1981, p. 130. ↑ Dimnik 2003, p. 272. 1 2 3 Berend, Urbańczyk & Wiszewski 2013, p. 429. 1 2 3 4 5 6 7 Engel 2001, p. 94. ↑ Almási 2012, p. 89. ↑ Engel 2001, p. 92. ↑ Berend, Urbańczyk & Wiszewski 2013, pp. 427–428. 1 2 Érszegi & Solymosi 1981, p. 132. 1 2 3 Bárány 2012, p. 143. 1 2 Fine 1994, pp. 105–106. 1 2 Fine 1994, p. 108. ↑ Bárány 2013, p. 462. 1 2 3 4 Van Cleve 1969, p. 387. 1 2 3 Runciman 1989b, p. 146. ↑ Almási 2012, p. 87. ↑ Bárány 2013, p. 463-465. ↑ Almási 2012, pp. 87–88. ↑ Bárány 2013, p. 463. 1 2 Van Cleve 1969, pp. 387–388. 1 2 3 4 Érszegi & Solymosi 1981, p. 133. ↑ Runciman 1989b, pp. 147–148. ↑ Richard 1999, p. 297. ↑ Sterns 1985, p. 358. 1 2 3 4 5 Van Cleve 1969, p. 393. 1 2 Runciman 1989b, pp. 148–149. 1 2 Archdeacon Thomas of Split: History of the Bishops of Salona and Split (ch. 25. ), p. 165. ↑ Richard 1999, p. 298. ↑ Van Cleve 1969, pp. 388, 393. 1 2 3 4 Kristó & Makk 1996, p. 238. ↑ Bárány 2012, p. 148. ↑ Fine 1994, p. 129. 1 2 Van Cleve 1969, p. 394. 1 2 Érszegi & Solymosi 1981, p. 134. ↑ Dimnik 2003, pp. 289–290. ↑ Berend, Urbańczyk & Wiszewski 2013, p. 425. ↑ Engel 2001, pp. 96–97. 1 2 Berend 2006, p. 152. ↑ Érszegi & Solymosi 1981, p. 135. ↑ Bartl et al. 2002, pp. 30–31. 1 2 Bárány 2012, p. 150. ↑ Engel 2001, pp. 85, 94. ↑ Berend, Urbańczyk & Wiszewski 2013, pp. 428–429. ↑ Ertman 1997, p. 273. ↑ Ertman 1997, pp. 273–4. 1 2 3 Érszegi & Solymosi 1981, p. 137. 1 2 Bárány 2012, p. 151. 1 2 Curta 2006, p. 403. ↑ Engel 2001, p. 114. ↑ Spinei 2009, p. 147. 1 2 3 4 5 6 Érszegi & Solymosi 1981, p. 138. ↑ Curta 2006, pp. 405–405. ↑ Engel 2001, p. 95. 1 2 3 Érszegi & Solymosi 1981, p. 139. ↑ Érszegi & Solymosi 1981, p. 140. ↑ Berend 2006, p. 155. 1 2 3 Érszegi & Solymosi 1981, p. 141. ↑ Berend 2006, pp. 154–155. 1 2 Berend 2006, p. 157. 1 2 3 Érszegi & Solymosi 1981, p. 142. 1 2 3 Érszegi & Solymosi 1981, p. 143. ↑ Berend 2006, pp. 158–159. ↑ Kristó & Makk 1996, p. 243. 1 2 Berend 2006, p. 160. 1 2 3 4 Érszegi & Solymosi 1981, p. 144. ↑ Engel 2001, p. 98. ↑ Kristó & Makk 1996, p. 244. ↑ Kristó & Makk 1996, p. 229, Appendices 2–4. ↑ Runciman 1989a, p. 345, Appendix III. ↑ Kristó & Makk 1996, p. 231. 1 2 3 4 Kristó & Makk 1996, p. 232, Appendix 4. ↑ Engel 2001, p. 97. ↑ Kristó & Makk 1996, pp. 236–237. ↑ Kristó & Makk 1996, p. Appendix 4. ↑ Kristó & Makk 1996, p. 243, Appendix 4. ↑ Kristó & Makk 1996, pp. 243, 282, Appendix 4. 1 2 Kristó & Makk 1996, p. 282. Almási, Tibor (2012). "II. András". In Gujdár, Noémi; Szatmáry, Nóra. Magyar királyok nagykönyve: Uralkodóink, kormányzóink és az erdélyi fejedelmek életének és tetteinek képes története [Encyclopedia of the Kings of Hungary: An Illustrated History of the Life and Deeds of Our Monarchs, Regents and the Princes of Transylvania] (in Hungarian). Reader's Digest. pp. 86–89. ISBN 978-963-289-214-6. Bárány, Attila (2012). "II. András balkáni külpolitikája [Andrew II's foreign policy in the Balkans]". In Kerny, Terézia; Smohay, András. II. András and Székesfehérvár [Andrew II and Székesfehérvár] (in Hungarian). Székesfehérvári Egyházmegyei Múzeum. pp. 129–173. ISBN 978-963-87898-4-6. Kristó, Gyula (1994). "II. András". In Kristó, Gyula; Engel, Pál; Makk, Ferenc. Korai magyar történeti lexikon (9–14. század) [Encyclopedia of the Early Hungarian History (9th–14th centuries)] (in Hungarian). Akadémiai Kiadó. p. 43. ISBN 963-05-6722-9. Sterns, Indrikis (1985). "The Teutonic Knights in the Crusader States". In Setton, Kenneth M.; Zacour, Norman P.; Hazard, Harry. A History of the Crusades, Volume V: The Impact of the Crusades on the Near East. The University of Wisconsin Press. pp. 315–378. ISBN 0-299-09140-6. Van Cleve, Thomas C. (1969). "The Fifth Crusade". In Setton, Kenneth M.; Wolff, Robert Lee; Hazard, Harry. A History of the Crusades, Volume II: The Later Crusades, 1189–1311. The University of Wisconsin Press. pp. 377–428. ISBN 0-299-04844-6.